기상예보에서 비가온다고 하였는데 이는 현실로 다가왔습니다. 광주에서 시작하여 다시 돌아오는 이 코스는 남쪽 해안 인근 섬에 있는 작은 어촌마을인 비토리로 라이더들을 데려다주었습니다. 15명의 라이더들은 06:00에 출발하였고 동쪽인 지리산으로 향하는 동안 젖었습니다. 75km 컨트롤인 구례를 지나자 비가 진정되었고 라이더들은 왼쪽으로 보이는 우뚝 솟은 지리산과 섬진강을 따라 라이딩을 즐겼습니다. 벚꽃이 장관이었습니다. 120km 부근에서 라이더들은 동쪽으로 진행방향을 꺽었고 비토리에 도착하기 전까지 산을 통하여 정처없이 헤멧습니다. 해변의 한일 해산물식당은 적당한 컨트롤이었고 라이더들이 광주로 향하기 전에 신선한 굴이나 초밥 그리고 다양한 진미들을 즐길수 있었습니다. 15명의 라이더들 중 13명이 제한시간인 20시간 내에 완주하였습니다. 한 라이더는 충돌로 인하여 포기하여야 하였고 (다행히 심각한 부상은 아니었습니다) 다른 한명은 기계고장으로 포기하여야 했습니다. 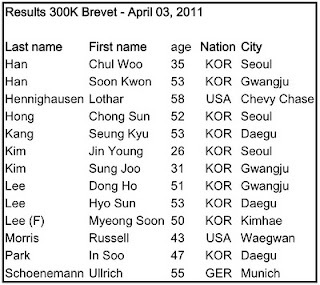 하지만 두 라이더들은 400K를 위하여 다시 돌아올 것입니다. 김해에서 오신 이명순님은 힘차게 라이딩을 하셨으며 이분은 한국렌도너스의 첫번째 회원이십니다. 서울에서 오신 홍종선님은 가장 빠른시간을 기록하셨습니다. 모든 라이더 여러분 축하드립니다! Pictures from the event. Rain had been in the forecast and rain it was. This course, an out-and-back from Gwangju, took riders to the tiny fishing village of Bito-ri located on an island off the southern coast. 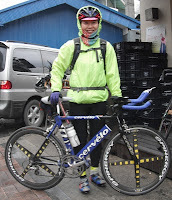 Fifteen riders took off at 06:00 and got soaked while riding east towards the Jirisan. After the 75k control in Gurye the rain subsided and riders enjoyed riding along the Semjin River with the Jirisan towering to the left. The cherry blossoms were spectacular. Around km 120 riders turned east and meandered through the mountains before reaching Bitori. The seaside Halin Seafood restaurant was an appropriate control and riders enjoyed a wide variety of fresh seafood, including oysters, sushi and other delicacies before heading back to Gwangju. Out of the 15 riders, 13 finished well within the time limit of 20 hours. One rider had to abandon because of a crash (no serious injuries had been reported) and one abandoned due to mechanical failure. Both riders will be back for the 400k. Ms. Lee Meong Soon from Kimhae was riding strong and she is our first Korea Randonneuse. 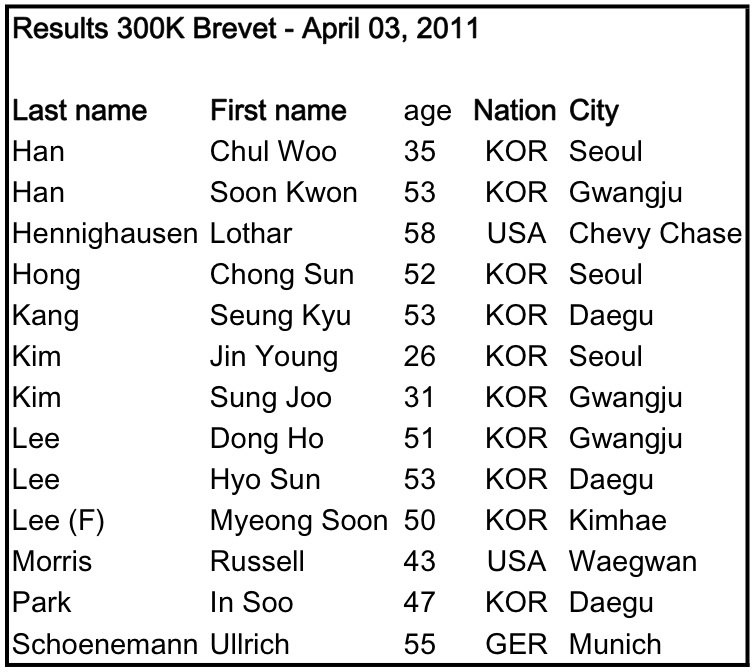 Mr. Hong Chong Sun from Seoul had the fastest time. CONGRATULATIONS TO ALL THE RIDERS! 개인적인 스케쥴 때문에 올해 다른 브레베는 참석 못할 듯 하지만..
and many thanks to everyone, also thank you Prof. Lothar for introducing and organizing such an incredible and fun events! !